Put the chicken into a dish, and add the oil, garlic, ginger, chilli, soy sauce, and sugar. Season with black pepper, stir well, then leave to stand for a few minutes. Heat a non-stick wok of frying pan, add the chicken mixture, in batches if necessary, and stir-fry for 2-3 minutes or until lightly browned. Pour in the stock, add any marinade left in the dish, then add the lemongrass, lime zest, water chestnuts, and coriander. Continue stir-frying for a few minutes more until the chicken is tender. Taste the stir-fry and add more soy sauce, if you like. 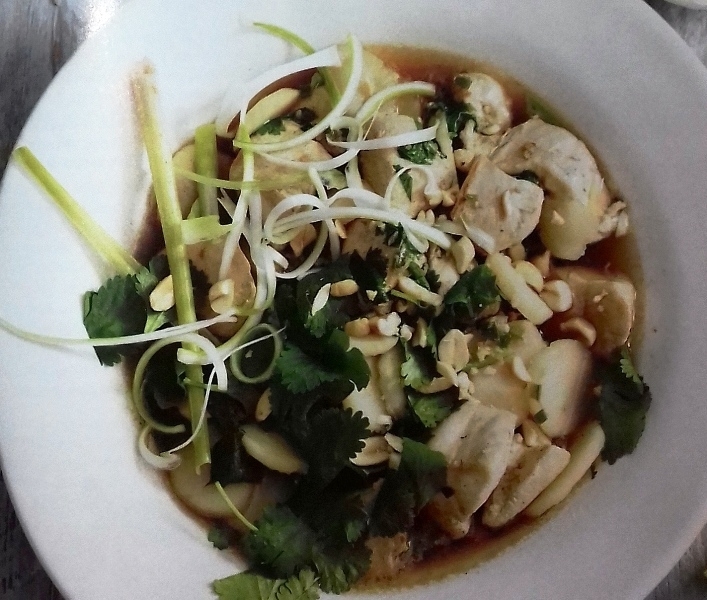 Serve at once, garnished with lime wedges, spring onion slices, and peanuts.